Construction is a booming market again in the United Arab Emirates. The end of the world economic crisis and the celebration of the Universal Expo 2020 in Dubai is attracting investment again and creating the necessity of new infrastructures, hotels, hospitals, etc. This positive situation has been reflected in the Big 5 Heavy show that took place in Dubai last march. 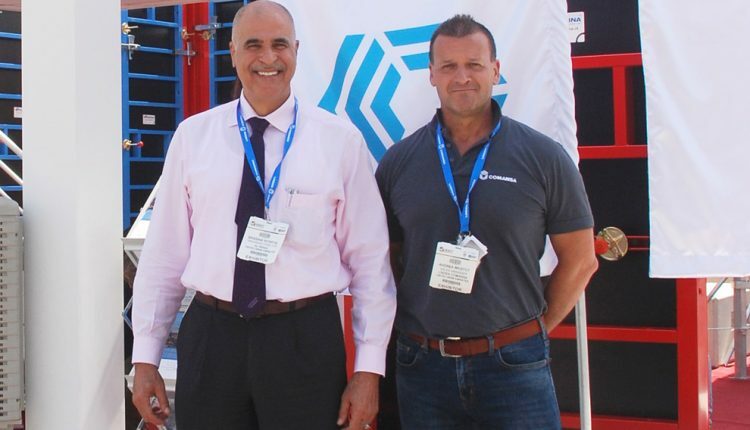 The leading rental companies, dealers and machinery manufactures, including Linden Comansa, participated in this event, which attracted visitors from all the Gulf region. Linden Comansa exhibited at the Big 5 Heavy along with its dealer in United Arab Emirates, Al Rana Equipment & Machines Trading Est. also known as AREMATES. With more than 35 years of experience in the tower crane market, AREMATES is one of the main rental companies in Emirates. AREMATES’ professional team of 75 people offers a complete service to the local construction companies to keep the projects always working; equipment rental, assembly, maintenance, spare parts supply, technical support, etc. According to Andrea Bristot, Linden Comansa’s Area Sales Manager for the Middle East, “during the three days of the show, we have been very busy with customers and potential buyers, not only from Emirates but also from Egypt, Oman, Saudi Arabia or Kuwait, which shows that the entire region is under an evident recovery. Another good indicator is that the world’s main tower crane manufacturers were at the Big 5 Heavy show. Fortunately, Linden Comansa keeps a very good position thanks to our partnership with AREMATES, and also due to our tower crane range, one of the most complete in the market”. “Our rental fleet includes many Linden Comansa tower cranes”, says Bassam Nowfal, General Manager and Owner of AREMATES. “Cranes with maximum load capacity from 10 to 16 tonnes are currently most demanded in Emirates, but there are other projects under development, like high rise residential or commercial buildings, the Metro, and all those related with Oil, which demand larger cranes. Thanks to having Linden Comansa cranes with higher capacity, like flat-top model 21LC550 or the 24-tonne LCL280 luffer, we are able to work in any type of construction project that takes place in Emirates”, adds Nowfal.